Funding guidelines and resources for programs can be found here. Q: What are the current stipend and tuition rates? A: The current stipend rate can be found here, and current tuition rates can be found here. The stipend rate is set by the dean of The Graduate School (TGS) and the budget office, and approved by the provost. This rate is typically announced during the winter quarter for the following year. Tuition rates are set by the provost’s office and approved by the Board of Trustees each spring. These rates are typically announced during the spring quarter. Q: Has the overall TGS student funding level decreased for 2018-2019? A: No. The amount of funding allocated to PhD students has increased, and Northwestern's funding for graduate students is at its highest level on record. Q: Why is the tuition rate for graduate students higher in their first two years? A: The graduate student tuition rate in the first two years is currently coupled with the undergraduate rate set by the Board of Trustees. Q: Who determines a student’s funding sources (e.g., whether a student will be paid on a fellowship or graduate assistantship)? A: Each program determines on a quarterly basis whether or not students will be funded using TGS funds or other sources (e.g., grants). When TGS funds are used, the program determines if this will be through a fellowship or graduate assistantship for each student. Students should refer to their admissions offer letter or program staff regarding their individual funding. Q: Are PhD students responsible for paying any fees out-of-pocket? A: PhD student funding covers tuition, stipend and a health insurance subsidy. Any other fees, such as the activity fee, are paid by the student. Q: How is a PhD student’s funding affected when registered for TGS 512 (Continuous Registration)? A: Students do not receive funding (stipend or tuition scholarship) when registered for TGS 512 and are not eligible for the health insurance subsidy. In addition, they do not pay the activity fee and are not eligible for U-Pass. The current tuition charge for TGS 512 is $100/quarter. Q: Is PhD funding different for international students? A: In general, international students are funded the same as domestic students. However, international students must pass TGS's English Proficiency Requirement before they can be funded as a graduate assistant/TA. Q: What other funding opportunities are available? A: Additional funding opportunities may be available based on eligibility through The Office of Fellowships, the Evanston Office of Financial Aid (loans), Interdisciplinary Graduate Assistantships (GAships), or TGS Internal Fellowships/Grants. It is the student’s responsibility to obtain approval from their program and coordinate other funding opportunities. Q: How many quarters of funding does a PhD student receive? A: PhD students in the Humanities and Social Sciences receive 20 quarters (5 full years) of funding. Additional quarters may be banked through the sixth year (see below). PhD students in the Sciences and Engineering are typically funded for at least five years through a combination of funding by The Graduate School (TGS) and adviser/program funding. Graduate student funding is a shared responsibility. While financial commitments are made to PhD students for a set number of years, it is important to understand that the overall graduate funding budget is dependent on a significant number of PhD students obtaining external funding. Q: During what months/quarters are PhD stipends paid? Q: How does providing interdisciplinary GAships, or other TGS funding, to PhD students in their sixth and seventh year result in extra expense? A: The Graduate School’s budget is established on an annual basis to provide the financial resources to fund students in their first through fifth years, plus the proportion of PhD students who are typically funded on banked quarters in their sixth year. 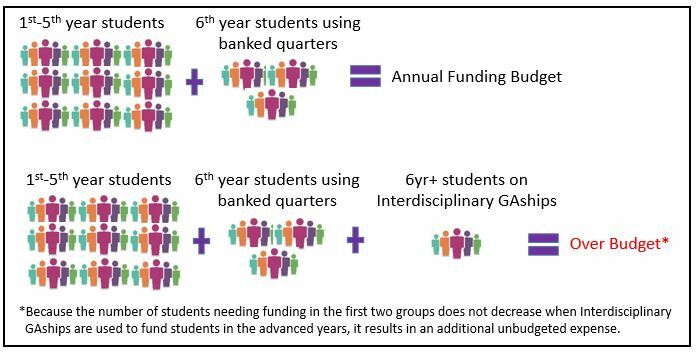 If a student outside of this group (i.e., an advanced year student not using banked funding) were to be funded on a TGS quarter of funding, such as an interdisciplinary GAship, it would result in an additional unbudgeted expense (see diagram below). Q: Is the funding for each program customized based on average time to degree? A: No. The University’s funding commitment is standard across all PhD programs. It is not tied to time to degree in order to maximize the funding available to as many students as possible. Q: What funding from The Graduate School is limited to a PhD student’s first five years? A: Any TGS quarters of funding, outside of eligible banked quarters, such as interdisciplinary GAships, cluster quarters, and competitively-awarded fellowships, such as the Nicholson Fellowship, Buffet Fellowship, etc., are limited to a PhD student’s first five years. Q: What funding options are available to a PhD student after their fifth year? A: At the home school’s discretion, eligible banked quarters may be used through a PhD student’s sixth year in the Humanities and Social Sciences. In addition, there is no limitation on funding from outside of The Graduate School, external funding from outside of the University, or scholarships related to external funding. In addition, TGS continues to provide research assistant scholarships (RAS), health subsidies, and tuition scholarships for PhD students with external funding beyond 5 years across disciplines. Q: Since most PhD students in the Sciences and Engineering currently receive less than 6 quarters of allocated funding from TGS, is there a plan to increase this amount? A: Yes. It is a strategic priority of TGS to request additional funds to support PhD students in STEM programs. Q: When a PhD student graduates, when does their stipend end? A: A PhD student will receive a stipend payout through the last day of the month during which they submit their final graduation materials. Q: Can PhD students bank some of their funding to be used later? A: At the home school’s discretion, Humanities and Social Sciences PhD students may use up to 4 banked quarters to extend their funding through their sixth year. Banked quarters are earned in years 1-5 when a student is funded on quarters outside of their 20 allocated quarters from TGS, such as through interdisciplinary GAships, external fellowships, grant funding, etc. Please check with your program staff or dean’s office to determine if your program participates in banked quarters. Q: Are banking policies consistent between schools? A: The Weinberg College of Arts & Sciences (WCAS) has a formal banking policy that is consistent with The Graduate School. Currently, it is standard for WCAS Humanities and Social Sciences PhD students to use banked quarters through their sixth year. Students in other schools should check with their program staff or dean’s office. Q: In addition to their stipend, can a PhD student perform additional work for pay? Students ideally should work no more than 15-20 hours total per week. Students are responsible for verifying that additional work for pay is permitted based on their funding source (e.g., NSF GRFP, etc.). Q: How does a student obtain loans? A: Email the Evanston Office of Graduate Financial Aid at gradfinaid@northwestern.edu. Q: Why can’t federal taxes be automatically withheld from graduate student fellowships? A: Even though graduate student fellowships are considered taxable income, federal law does not require taxes to be withheld, and the amount to withhold varies by individual. To help avoid a significant tax payment at the end of the year, students are encouraged to complete a W-4 Form and indicate an amount they would like Payroll to withhold from each stipend payment. Learn more in the Funding section on our TGS website. Q: Why can’t the student activity fee be automatically deducted from stipend payments? A: There is not currently a mechanism in place across the multiple University systems to automatically deduct the student activity fee. If a student activity fee is not paid on time, a registration hold may be placed on the account and a late fee may be charged. Be sure to check your student account on a regular basis. Q: How are undocumented or DACA students funded? A: Undocumented students who are not authorized to work in the U.S. must be funded on fellowships for their entire tenure in the program. DACA (Deferred Action for Childhood Arrivals, a.k.a. Dreamers) students who have work authorization may be funded on assistantships or fellowships. Q: Who is eligible for the health care subsidy? A: All TGS students who are registered full-time (3-4 units) during the fall quarter are eligible for the healthcare subsidy for the full academic year (Sep 1-Aug 31). The subsidy is automatically applied during the fall quarter as long as the student is enrolled in the Northwestern health insurance plan.